There is substance here for good applied science. At the age of 68, with plenty of time as a retired geologist: we need to talk. I see a potential for developing 4SM into an automatic process. I want to contribute to this effort. I also want to develop a graphic interface. I might as well release 4SM under some flavor of GPL license. I just need some encouragements and support. Sea truth: that's what is most wanted. Your cooperation, commitment, resilience as a SuperUser: that comes next! Exposure: links from my website to your own reporting of climbing the 4SM learning curve on your own website. Worldwide: develop experience over a wide variety of shallow water environments worldwide. Band setting: develop experience over a wide variety of multispectral and hyperspectral imageries. Wavelengths: consolidate a database of specific operational wavelength for each waveband of all possible multispectral imageries. Reflectance: calibrate spectral LM=LsM-La in units of reflectance through offset and gain values, and vice versa. Spectral Soil Line database: map variations of operational spectral shallow water LM along the coasts worldwide, in units of reflectance. This shall take the form of a series of LMWL values in units of refelctance, to be attached to a particular location on site, or to a particular generic type of bright beach material (coral sand, etc). This should be enough to specify the local Soil Line for any spectral image down the line. Spectral Knir database: this exercise should yield a fairly secure set of Knir values for all wavebands involved. if we can prepare a bottom typing map ahead of any field work, sure the planning of that field work shall become much more reasonable and rational. 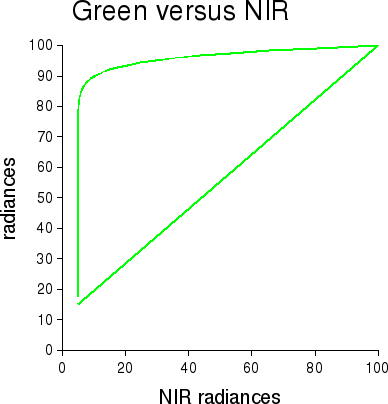 provided the set of Ki/Kj ratios is secured from the image itself, then the bottom typing does NOT depend on any seatruth on computed depths. all that's needed then is to work out the labels for bottom types identified, and reduce/bin the list of arguably distinct types. Lsw: develop a way to estimate Lsw automatically from the image. This is easiest in the red-nir wavebands. sampling the spectral Soil Line may be done automatically for the pair of red and nir bands of the image. read applicable local spectral LM values for all wavebands of the image from the database of spectral soil line in units of reflectance. convert these values into units of DN of the image. derive the value of slope LMred/LMnir which applies to the image. this defines the Soil Line in a scatter plot for this pair of bands in the image. 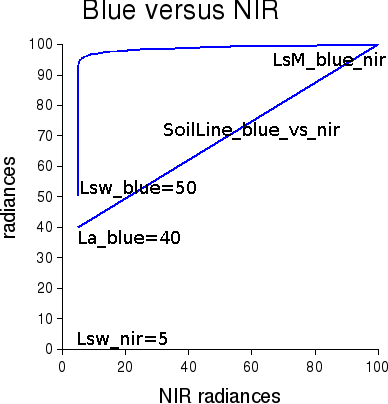 This soil line is the straight line which starts from spectral La (~=the TOA radiance of a black body at null depth) and reaches through spectral LsM=LM+Lsw (~=the radiance of the brightest shallow bottom type at null depth at the top of the atmosphere) with a slope value of LMred/LMnir. apply a tolerance of ~1.18 to the value of this slope: slope*1.18 and slope/1.18; in other words allow for a certain level of fuzziness of the soil line in the image, as it is well known that the system noise increases as the radiance level increases. 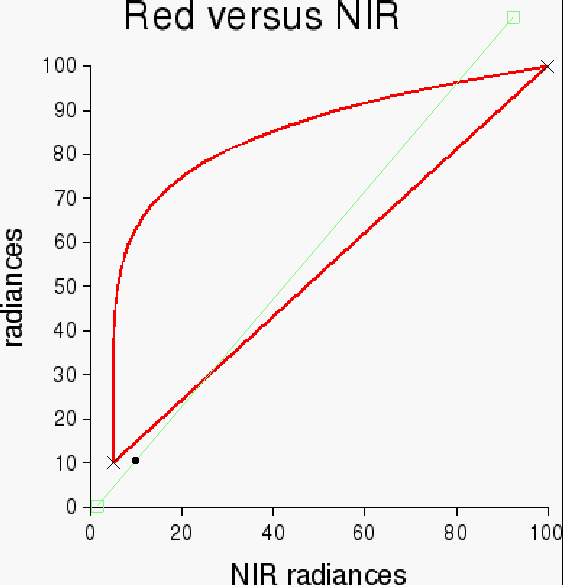 select all spectral pixels of the image which plot inside this tolerance in a scatter plot of Lred=Lsred-Lswred versus Lnir=Lsnir-Lswnir. we also need a similar way to segment clouds out. 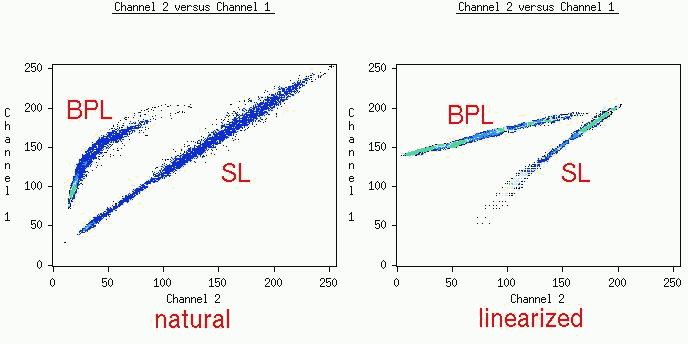 in the scatter plot of Li versus Lnir, determine spectral Lai for all bands i through a simple geometric construction. this is usually fairly straightforward provided the image exhibits some bare land, from dark to bright. 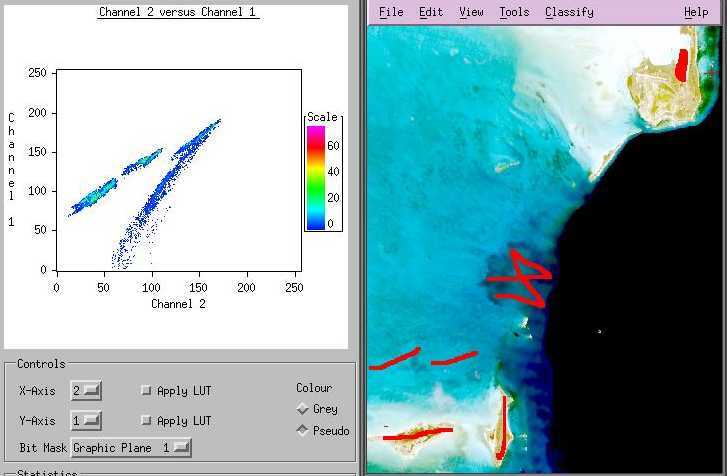 in case the image is totally under water, chances are that the Soil Line may be set to be parallel to the Darkest Pixels Line: Davies Reef. select the Brightest Pixels Line for all pairs of bands from cloud free marine areas of the image. this does not need the image data to be deglinted, through the LsNirMaxBPL parameter of the -Extract command line argument. linearize the Brightest Pixels Line data for all pairs of bands. work out the best fit of a straight BPL line with the observed BPL pixels for the Blue/Green pair of bands: its slope if the ratio Kblue/Kgreen. use Jerlov's data to interpolate the intermediate marine water type which applies to this slope. use this slope to derive spectral K for all visible wavebands. check that these values are acceptable. provided there are some glinted areas over optically deep waters, it should be possible to ascertain the Glint parameters through some automated process. for each shallow water pixel of the image.